Broke in the OC: Style Week OC is Back! 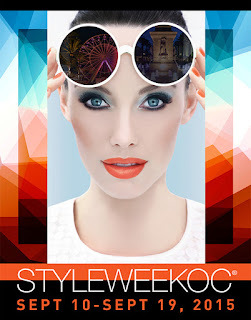 Style Week OC is Back! Fall fashion is here with Style Week OC. The very trendy event is taking place at 3 different locations in Orange County during the dates of September 10th through 19th. It's going to be a lot of fun! What to expect: tons of fun fashion shows, shopping parties, style and beauty presentations, swag, celebrity sightings (speculation) and more. Nick Verreos of Project Runway fame is again hosting the esteemed Celebrity Cruises Design Competition! The competition is Sept. 12th, 7pm at Fashion Island. The event is free and open to the public. FIDM design graduates compete with their best garments, stunning the audience with their unique voice. True to the California lifestyle, the Surf + Action Sports Showcase will be a fun event for the outdoorsy and outgoing. The event will celebrate "20 years of style from OC’s iconic fashion brands including Hurley and Vans." Head to the Irvine Spectrum Center on Sept. 18th at 7pm. The Neiman Marcus Children's Show will feature cute little guys and gals strutting in adorable fashion from brands such as Kenzo, Kate Spade, Little Marc Jacobs, Chloe and more. The show takes place at Fashion Island on Sept. 12th at 12pm. This is a free event. With plenty of free fun there is no reason to miss these events. Limited seating will be available for fashion shows open to the public so get there early. Fun, fun!